With their smooth black bone handles and "Be Prepared" shields, the Electrician and the Wrench knife differ from all the other knives in the series. The shield is also used on all the other Electrician and wrench knifes. I'm not sure why the different shield is used on these knives but it really doesn't matter much as the series doesn't have a distinct shield. As with most Electrician knives, the flathead screwdriver is held open with a brass liner-lock. the lock is very positive and certain. No play whatsoever. Both blades also snap to the half and full open position. If you like electrician knives, this one is definitely one worth having. Of note, however is the bottom edge of the screwdriver. It is one sharp puppy and needs to be treated with care or you will slice open a digit. This is not always the case on the screwdriver in electrician knives. If you aren't used to that edge being sharp and intend to carry the knife and are not concerned about keeping it in mint condition, you may want to take a file to the edge. 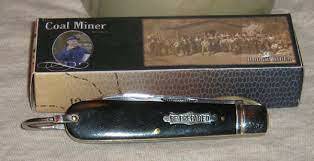 Old American made electrician knives in good used condition go for a dime a dozen. So it is hard to say you can't get a good user for this price. But this one isn't used and looks fantastic. 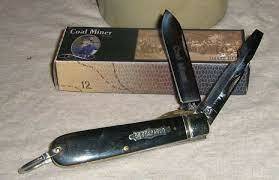 It is a top-notch knife worth being in a pocket of display case.